SpaceX fired off a Falcon 9 rocket from the coast of California Thursday, propelling a small Taiwanese research satellite into orbit in the rocket builder's 12th flight so far this year, a blistering pace that could exceed 20 flights by the end of 2017. Because the lightweight Formosat 5 satellite was bound for a relatively low polar orbit, more than enough propellant was left over for the first stage to make a powered descent to a successful landing on the deck of an offshore droneship about 11 minutes after launch. Recovering spent booster stages is a key element in SpaceX founder Elon Musk's drive to lower costs by recovering, refurbishing and re-launching rocket components. SpaceX's landing record now stands at 15 successful recoveries in 20 attempts -- nine on droneships and six on land -- and its 10th success in a row dating back to June 2016. But getting the payload to orbit was the primary objective of the flight, and the Falcon 9 did just that. While the first stage was flying back to Earth, the second stage was completing Formosat 5's boost to orbit, releasing the spacecraft into a 447-mile-high polar orbit about 30 seconds after the first stage landed. Formosat 5 is a half-ton satellite built by Taiwan's National Space Organization, of NSPO, as a demonstration of the country's aerospace manufacturing prowess. 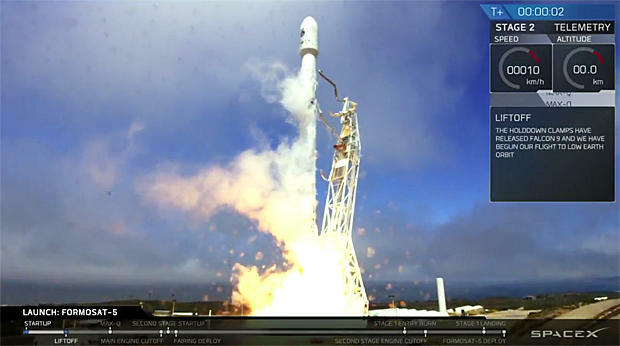 One of the lightest payloads yet launched by a Falcon 9, the satellite is equipped with a camera capable of 6.6-foot resolution in black-and-white imagery and 13-foot resolution in color. It also carries an Advanced Ionospheric Probe provided by Taiwan's National Central University "to measure ionospheric plasma concentrations, velocities, and temperatures over a wide range of spatial scales," according to the NSPO. "Transient and long-term variations of ionospheric plasma can be monitored as seismic precursors associated with earthquakes." Formosat 5 is the first major mission built from the ground up and managed by Taiwan. The NSPO reportedly booked the flight in 2010, paying a bargain-basement $23 million for the Falcon 9 launch, less than half the advertised $60 million price tag. The NSPO originally expected to share the Falcon 9 with a second payload, a dispenser built by Spaceflight of Seattle, designed to deploy 90 small "cubesats" into orbit. But in the wake of launch delays following two Falcon 9 mishaps, Spaceflight moved most of the cubesats to other vehicles, according to Spaceflightnow.com. The Formosat 5 mission began under low, patchy fog when the Falcon 9's nine Merlin 1D first stage engines ignited with a torrent of flame at 2:51 p.m. EDT (GMT-4; 11:51 a.m. local time). After a final round of lightning-fast computer checks, the rocket was released from launch complex 4-East at Vandenberg Air Force Base northwest of Los Angeles. The 129-foot-tall rocket quickly climbed away from the pad and arced away to the south over the Pacific Ocean trailing a brilliant jet of exhaust and leaving a crackling roar in its wake. Two-and-a-half minutes after liftoff, now out of the thick lower atmosphere, the engines shut down, the first stage fell away and the Falcon 9's the second stage, powered by a single engine, took over to continue the climb to orbit. Returning stages carry out at least two and possibly three rocket firings to make it back to the launch site or a droneship: a three-engine "boostback" burn to reverse course; a three-engine entry burn to slow down still more for descent into the lower atmosphere; and a single-engine landing burn. For the Formosat 5 launch, the boostback burn was deleted and the stage flew a lofted, ballistic trajectory to the downrange droneship "Just Read The Instructions," firing three engines for entry and then a single engine before deploying four landing legs and setting to a smooth touchdown. Virtually the entire descent was visible in live video from the falling booster. The second stage engine, meanwhile, had shut down as planned about the same time the first stage was carrying out the entry burn. Two minutes later, Formosat 5 was released to fly on its own. While SpaceX does not release detailed schedules, up to nine more missions are are believed to be planned this year, pushing the company's 2017 total to 21 flights if current projections hold up.